Twenty-five years, 125 performances, endless applause. Rainbow Theatre’s 25th season opens with “Stop Kiss” and “Coloured Museum” — two plays that grapple with identity politics and the violence of oppression. A troupe housed by the Cultural Arts and Diversity Resource Center, Rainbow Theatre celebrates diversity and creates visibility for the cultures that make up the UC Santa Cruz community. Since its inception as a student-run club in 1993, Rainbow Theatre has evolved to be a five-unit class offered every fall and spring quarter. This year’s fall programming will include five performances over the first three weekends of November, including multicultural and poetry plays that are chosen, directed and acted by Rainbow Theatre students. 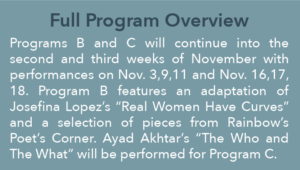 The five performances are spread across three programs, A, B and C, which will feature a combination of reworked professional plays and original student works all centered around themes of identity and culture. 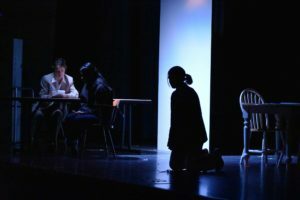 After weeks of preparation, Rainbow’s entirely student-run show will debut with two productions in Program A, which highlights the complicated realities of being a person of color in the U.S. This year’s Asian-American show “Stop Kiss” and African-American show “Coloured Museum” will be shown on Nov. 2, Nov. 8 and Nov. 10 at the Stevenson Event Center. “Stop Kiss” follows protagonist Callie and her lover Sarah as they navigate the homophobic culture of 1980s New York City. 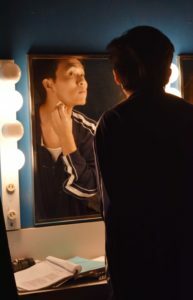 Rainbow’s version of the play is directed by fourth-year Naythan Antonio Ramos and adapted from the original script by Diana Son. Each actor’s performance brings profound emotion to the stage as the play’s non chronological narrative oscillates from charmingly banal to desperately tragic. Ramos’ version utilizes a complex series of strikes and lighting changes. 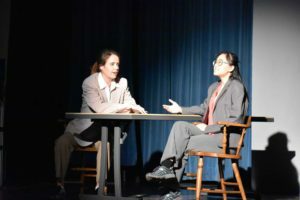 Throughout the show, the stage is transformed into a hospital room, Callie’s apartment and a police interrogation room. The second half of Rainbow’s “Program A” highlights a selection of vignettes from George C. Wolfe’s “Coloured Museum.” The play is co-directed by fifth-year Cipi Espaldon and fourth-year Jokaelle Porter, who adapted the original screenplay for Rainbow’s cast. “Coloured Museum” examines African American identity and culture, often incorporating satire to elicit a visceral reaction as audiences are forced to confront unsettling truths lurking behind the play’s comedy. In one featured vignette titled “Symbiosis,” two actors embody the past and present versions of a man caught between identities. The protagonist’s present self is intent on abandoning his past and delivers an impassioned monologue as he violently trashes records, clothes and an afro comb. “Being Black is too emotionally taxing,” he yells. Another character, his youthful alter ego, tries in vain to stop this rampage, shouting “the kid is here to stay” no matter how much of a fight he must withstand. The scene is a powerful expression of the often painful process of reconciling identity in a racially divided world. Artistic director Donald Williams founded Rainbow Theatre at UCSC in 1993 and continues to lead the group today. He established Rainbow Theatre for students who wanted an outlet to be creative and talk about their unique identities and experiences. According to its mission statement, Rainbow’s goal is to foster unity by providing an outlet to consider social and political issues communities of color face. Rainbow’s diverse programming also creates space for students of color to act in roles they can relate to. After its first round of performances, Rainbow gained notoriety among communities of color on campus. Students were enthusiastic about the diversity represented in Rainbow’s shows. Eventually, the admissions department took notice of the troupe and decided to offer Rainbow Theatre as a five-unit class. Donald Williams explained that instating Rainbow as a class incentivized participation because it allowed students to receive compensation for their hard work. The administration also recognized Rainbow was helping with retention for students of color, meaning students who participated in the class were more likely to stay at the university and complete degrees. From the start, an important academic retention strategy has been outreach. Rainbow’s community engagement aims to get high school students interested in theater and excited to pursue higher education. Every year, the troupe visits predominantly Chicanx and Latinx high schools in Los Angeles to talk with teenagers about cultivating diversity and visibility at universities. By reflecting the identities of young people in the troupe, Rainbow teaches students there is space for everyone in theater and in higher education. Making theater relevant and accessible is a core value for Rainbow, and its outreach programs are a part of the way they ensure that their message reaches as many people as possible. Corrections: In the print version of this article, CHP incorrectly reported the year the program was founded. Rainbow Theatre was founded in fall 1993. Additionally, Rainbow does not outreach to schools in Santa Cruz, as was stated in the print edition.